Tensions are rising in Kosovo as a decision on its long-term future nears. 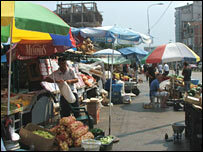 The international community says it wants the Serbs and ethnic Albanians to reach an agreement by the end of the year. Otherwise, a settlement may have to be imposed. In the divided city of Mitrovica people seem a long way from agreement. At 0900 the men are sitting outside the bars drinking beer and rakia. With sky-high unemployment, there is not much to do apart from think of the future and gaze at the bridge separating the two halves of the city. The portakabin shops which line the street add to the pervading sense of the temporary. Patrolling international police and K-For troops seem to outnumber the locals. Welcome to north Mitrovica, the last Serb urban area in Kosovo. It is tense, depressing and the people are scared about the future. 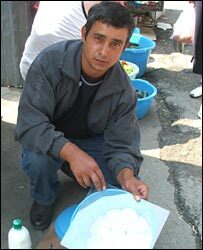 On the pavement, Dragoljub Mitrovic, 37, is trying to sell a heap of cheese in a blue bucket. He has travelled from his home village, through an Albanian area, to try and make some money to feed his wife and two children. "All Serbs, including me, live in constant fear. The UN brings us here on special buses. If Kosovo becomes independent, I'll pack my things and leave and try to get asylum elsewhere. There'd be no life for me here. I'd look for democracy in Europe." Technically, Kosovo remains a part of Serbia. But in reality it has been run by the United Nations since the end of the war in 1999. 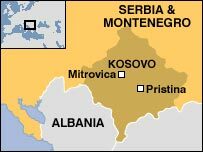 In March 2004, violence exploded across Kosovo in anti-Serb riots, as Albanian mobs attacked Serb communities and burned down churches. In all, 19 people died. The violence began in Mitrovica. The vast majority of Kosovo's people are Albanians who want independence. Serbs want anything but that. Oliver Ivanovic, 52, is a leading Serb politician, a member of the Kosovo parliament and regarded as a moderate. "We have been living in this hotspot since 1999, all the time living under some tension, all the time attacked by Albanians in the south and all the time coming under pressure from the international community. "Sometimes we are under the impression internationals are not happy that we stay here. We are the troublemakers. And this does not help our relations with them," he says. Pass the French troops stationed on the bridge over the River Ibar, that separates the Serb north from the Albanian south, and you enter a different world. The place is humming: crowded, colourful, energetic. There is a sense of expectation. Edmond Jolla, 32, is Albanian and the owner of the upmarket restaurant Ex. "Everyone is expecting independence. In terms of my business, independence would enable me to invest for the future. Everyone will live better. I have two flats in north Mitrovica and when we get independence I hope to get them back. The war is finished," he tells me. Drive 45 minutes south and you arrive at the air-conditioned, spankingly clean New Government Buildings in the capital, Pristina. The former Albanian guerrilla leader-turned-prime minister, Agim Ceku, is sharp-suited and smiling when I arrive. He tells me the government will accept nothing less than independence - and partition is out of the question. "We are expecting full independence. We are sure it will be for the benefit of the region and for local Serbs. We are making a lot of commitments to them. They will benefit from positive discrimination. And Serbia will be free. They will have no enemies around, they will have no need to pay a lot of money to fund power structures and no reason to have large security forces." Back in Mitrovica, it is no secret that both communities are well-armed and ready for a worst-case scenario. "I will do whatever is in my capacity, physically and intellectually, to defend our right to live in peace and dignity and to live freely in our state. I, like most Serbs, will not accept being moved from one state to another," says Milan Ivanovic, one of north Mitrovica's most popular politicians. K-For recently reopened its base north of Mitrovica and close to the border with Serbia proper. Extra UN police have been deployed in the region. All in case it all goes wrong. An old man, carrying a bag of shopping and wearing a traditional Serbian shaikatcha cap, sits in a bus shelter on the main street in north Mitrovica. Behind him, pasted on the shelter, are black death notices of people who have died, of natural causes, during the past few days. The people of north Mitrovica are waiting for something to happen. And whatever is going to happen, they believe, is not going to be good.